‘Grosspapa’ was very much part of our upbringing and we loved him very dearly. Paul, Peter and I shared one big nursery during our early childhood. When we had gone to bed, Grandfather would be with us. He always told us stories about real people, which we loved. But before telling us the story he would look into our eyes to see whether we had been good and truthful, and at the same time we felt able to confide in him if something had upset us. When we were 8-10 yrs old grandfather started the three of us playing the violin. Back in his native Poland in his younger years he had played folk music for the villagers to dance to. Without being able to read music, he was able to teach us just by playing these simple tunes to his attentive young audience, which he did when he came round in the evenings several times a week. We soon absorbed many tunes this way, and played them together with grandfather. Then Paul wrote them down and added a piano accompaniment. The day came when Grandfather said, “I cannot teach you any more, and will find you a proper teacher.” And the 3 children started with a close friend of his. Paul was always miles ahead and was able to pick up any music and play it. 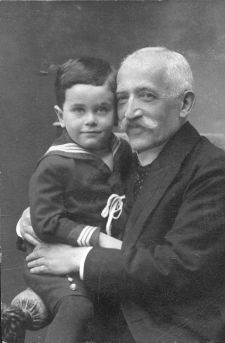 When one day he brought home the Beethoven Violin Sonatas and with Peter accompanying him, he began to tackle the Kreutzer Sonata, Grandfather tried to stop him (“that’s much too hard for you”) but he soon relaxed and sat back with great happiness to enjoy their playing. We played a lot of wonderful trios – Peter on the piano, Paul and I playing violins. These evenings filled with music were the happiest times for the 3 of us, with Grandfather sitting in front of the fire, listening. 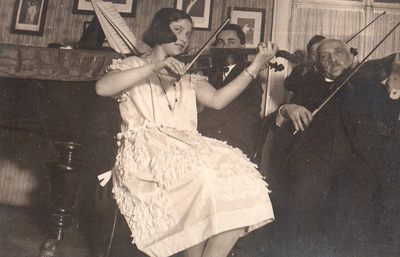 Sometimes our parents would come in, and Mutti would pick up the violin and join in. The great favourites were the Bach Double Concertos, which we played many times. These happy times with grandfather listening meant a lot to all of us, and it was only when I left Vienna and suddenly was without music making with my family, that I realized what a rich and precious life I had had in the Schellinggasse. Our home in the Schellinggasse consisted of seven rooms. At one end was Papa’s music room where he taught singing. There were 2 grand pianos in the room. At the other end in our “kinderzimmer” was an upright piano for us. Mutti used both rooms, depending on whether she worked with Papa, Paul, or others. The 2 rooms were well apart from each other, so that we could make music in both rooms at the same time without disturbing each other. In the evenings Paul would relax at the piano after his studies at the Academy, just playing often for hours. I often sat quietly listening, into the darkness, filled with admiration for Paul, this wonderful musician brother of mine. When he noticed I was there, he would ask me, “What composer next? What sonata now?” I was absolutely in heaven, Paul just had such music in his finger tips. At home one day, Paul stormed in to the room and said angrily to me, “I wish you could play the viola. I have a quartet tonight and our viola player is ill. Look, it’s quite easy, all you have to do is to learn to read the viola clef.” And he showed me how. “And this quartet has a little viola solo at the beginning of the second movement. Now practice these few bars, you will be quite alright.” And I practised, and I played, and I was thrilled. It was my beginning of playing the viola, which opened a completely new era of music making for me. There were few viola players about and I got as much chamber music as I wanted, and I was overjoyed. I remember one evening we were playing quartets and I was busily tackling a difficult viola part. At the end of the quartet a deep voice behind me said, “Beautifully played”. And there was Papa, standing behind me, sharing my happiness that I could be part of this quartet. Playing chamber music at home became a way of life, and was to remain the greatest treat for me always – whether Haydn, Mozart, Beethoven or Brahms. 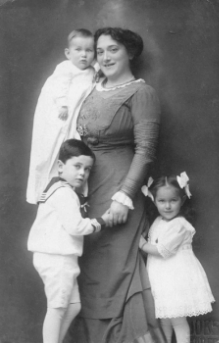 Mutti was one of the much loved Viennese lieder singers of her day. She had a very pure soprano voice, and her teacher had been Papa. Her singing filled our home with the sound of beautiful lieder. It was a great treat to listen to her practising her programme for a concert. With her voice production and expression she would make you feel you were living in the song. I remember one evening sitting in a corner of the room while she was singing Schubert’s ‘The Erlkönig’ with Paul accompanying, and feeling shivers go down my spine. Afterwards I was still shaking and too frightened to go to the bathroom lest I met the Erlkönig. Papa had been one of 12 children, and left his home in Russia where there was much poverty, to come to Vienna. On the way he sang at the Court of the Queen of Romania, and she presented him with an engraved piece of glass. Arriving in Vienna, he rapidly attracted many singing pupils. Papa had a beautiful warm baritone voice, and singing together my parents gave concerts in Vienna . On one memorable occasion of a family gathering with Uncle Ernst and Aunt Ida, we all begged my parents to sing together – which they did, with Paul accompanying. I just cannot describe the sound of these two wonderful voices together. It was probably the most deeply moving and unforgettable singing I have ever heard in my life. 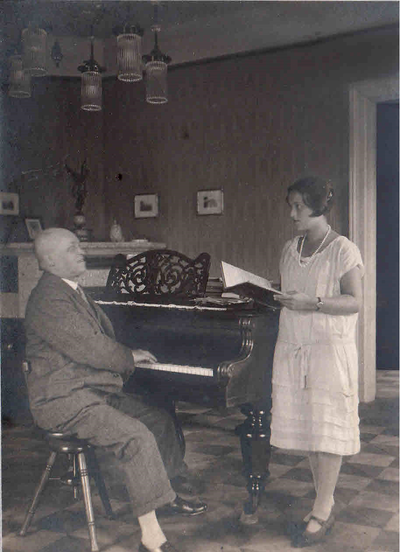 (The Duet was ‘Am Hohnederbusch’ but I cannot remember the composer.) When they had finished I was in floods of tears, but I was not the only one in the room completely overcome. It was not very often that we heard Papa and Mutti sing together. Papa worked extremely hard, and always had far too many pupils. So very often in the evenings he was just too tired for music. Amongst his pupils Papa had some superb singers. And we children were never allowed to go near the music room in case we made a noise. But being three of us, we plucked up courage, and when someone as special as Klara Quartin came for her lesson, we had a plan. In the waiting room next door to the music room was a small, square table covered by a heavy tablecloth which reached the floor. As soon as Klara had arrived and gone into the music room for her lesson, the three of us crept in to the waiting room and under that tablecloth, our hearts pounding. There we stayed on many occasions to listen. My father did not find out for quite a long time. One lovely summer’s day, Klara sang Mozart’s Queen of the Night aria from ‘The Magic Flute’. Her coloratura singing was quite out of this world. When the aria ended, we suddenly heard shouts of ‘bravo, bravo!’ All the windows were open, and quite a crowd had gathered in the street below who were clapping. From the opposite side of the road came more shouts of ‘bravo, bravo!’ where the Director and staff of Radio Wien had their offices and were hanging out of the windows. The three of us children joined in the scene, overcome by this unique performance. My father, in addition to his Viennese pupils, taught a great many in Prague, Bratislava and at the Conservatorium in Brno. As far as I remember, he worked every weekend, and still the days were never long enough. 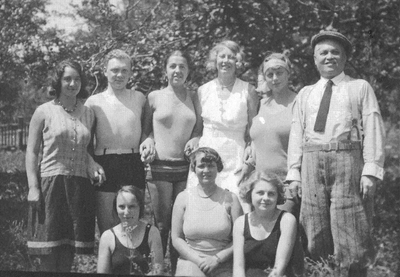 One summer, my mother felt that Papa was in need of a good holiday. So we all went off to stay at Kirchberg am Wechsel. I was very happy to have the opportunity to go for long walks with my father. After a few days, unexpectedly one of my father’s pupils turned up, just to join us on our holiday. A day later another pupil turned up. To our amazement, by the end of the week some 10 to 12 pupils had arrived. Papa, somewhat amused and bewildered, but always enthusiastic to teach good musicians, hired the music room in the local village school and taught there every morning. The afternoons were kept free. We all thoroughly enjoyed the company of these young singers, and got extra concerts thrown in as a bonus. Papa could never refuse to teach anyone with a beautiful voice, even if they were without means to pay. Nor could he be persuaded to teach anyone who did not have a good enough ear. One young Hungarian girl came with her mother from Budapest, wanting to become a professional singer. My father was offered a good deal of money, but in spite of this he had to tell her that she had not got a good enough ear and he could not teach her. She was heartbroken and in tears, and begged my father to make an exception. Poor Papa, he had to send her home. One day Papa asked me if I would like to have a singing lesson. “Oh no, I have no voice and I cannot sing,” I said. Papa just smiled. He must have known that I had not got the courage to open my mouth and sing, least of all with my mother about. One day he succeeded in getting me into the music room. His face and his happiness, when I sang a few notes, I shall never forget. I suddenly discovered I had a voice. And I refused to believe Papa when he told me I’d just sung the high B. How lucky I was to be given these wonderful singing lessons by dear Papa. Little did I know then, what singing would mean to me one day. It was not until I got married, that I discovered the unbelievable joy to sing to others, to sing to my dear Denis. My singing filled both our hearts with great happiness.